SitePoint already has a long list of articles on WordPress theme frameworks, but as you’ll see, there are dozens of frameworks out there, all with their own strengths and weaknesses, and catering to different styles of development. I was sitting in my office, scratching my head, thinking about WordPress theme frameworks. It is late I’ve been researching for this article for days, weeks, even months and wondering what to write, that is different and unique to the other writing styles about frameworks. Lost in my thoughts I had a brain wave. It occurred to me that when people write about WordPress frameworks they tend to cover only the main ones, you know… the ones that the developers in your local WordPress Meetup community specialise in. frameworks like Genesis, Thesis or WooCommerce. Why is that? Maybe they didn’t look hard enough, or maybe they didn’t want to write about frameworks that might just die off (or are no longer developed). Or maybe they had a tight deadline, and defaulted to the top ranking ones from the search engines. Who knows? I want to be different! Yeah that’s right, sit back grab a coffee. I’m going to take you through a Definitive Guide to WordPress Frameworks. Why definitive? Definitive by definition means “done or reached decisively and with authority. synonyms: conclusive, final, ultimate”. I’m not going to stop at one, two, or even ten frameworks. As I said I’ve been researching this for some time. The list is massive. There are quite a few here that many of you may or may not have heard of. But that’s ok for the purpose sharing and learning from each other. You may find a framework here that you want to contribute too, or suggest one that’s not listed. 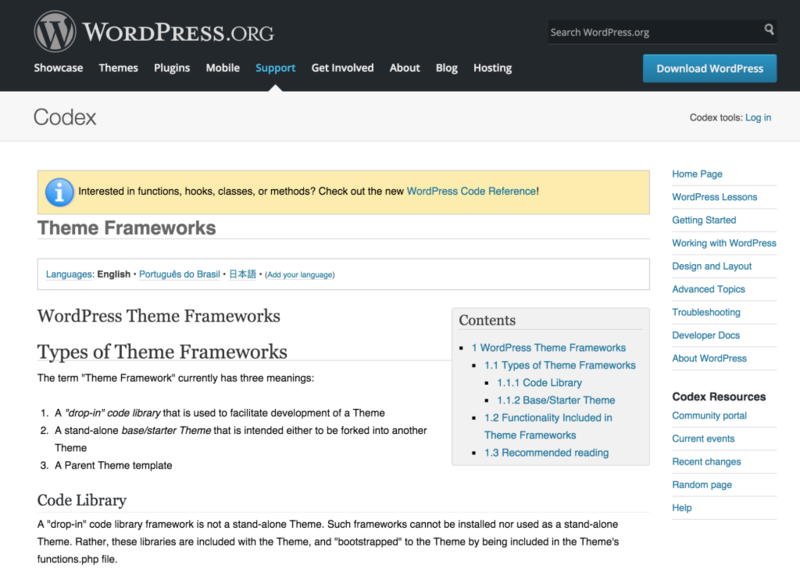 What Defines a Theme Framework or What Is a WordPress Theme Framework? Before diving into the list, I just need to cover some background into theme frameworks. After all, this may be the first article you’ve ever read about theme frameworks and I don’t want you to be left out. If you’re a veteran of frameworks you can skip down below to the long list of frameworks. A theme framework is essentially a Parent Theme in which a development team or individual developer would create to offer some functionality, that would make it easy to update, and reuse on many sites without effecting the design of individual sites. A Child Theme would then be created to create the custom style sheet, but the functionality would be left up to the main framework. On a side note, this doesn’t mean that every parent theme is in fact a framework. There are template providers out there that provide parent themes with many hundreds of child theme variations, but then don’t use that same code base on their next parent theme (they tell you it’s a framework, when technically it’s not). Over at the WordPress repository they break down three meanings for the term “Theme Frameworks” drop-in, stand-alone, and Parent Theme template, it’s pretty hard to define it any simpler and I suggest you have a read over it sometime. For the purposes of this article I’m going to concentrate more on the last one, Parent Theme Templates. This is the most common form known to the greater development community and the general public. Frameworks come in many forms, and tackle different aspects of business and design. Some are free and some paid. There are major frameworks which are generic, in the fact that they don’t target any one specific niche but cover broad multifunctional aspects of any industry, helping web designers and developers world wide offer advanced websites with quicker turnaround and build costs, by leveraging these code frameworks. Some of these frameworks have been built over many years with countless thousands of hours of development, to build out extensive, extremely well documented and supported frameworks. Some advanced features of these frameworks are the allowance for frontend drag and drop editors, backend drag and drop, shortcodes, built for many devices and layouts. It’s no wonder why web businesses love using frameworks. My current favourite framework is the SEO Design Framework, built to help rank you better. It’s a good question, why use a WordPress framework? While you may think that you may never actually need to build your own framework, you may have already used a framework without really realizing it. Frameworks like Genesis and WooFramework, Thesis, are now so common that you could almost be forgiven (or at least forgive a newbie) that it was part of WordPress core. Let’s take this example. Noel Tock built websites for the hospitality industry niche. Building his own framework was a benefit to him, so he could deliver great projects to his customers and continually add value and optimize it for performance, without the bloat of other functions that his customers will never need. This helped him to speed up development, and offer a more long lasting solution to his clients. Added benefits can go as far as saving his team support and training time for new staff and clients. There are many benefits that he had to consider like SEO and development best practice. But he had the benefit that he didn’t have to go and get a bunch of plugins to add much needed items like rich snippets, social comments, and mobile first design. As well as build email lead generation forms and so on. He gave the clients flexibility of a semi custom design, and could easily create new designs just by editing a new style.css and functions.php file. For him this has evolved into a SaaS solution, and his framework turned into the service Happy Tables. Have I got you thinking? What’s your niche? And how about a framework for your vertical? There are many advantages to using a WordPress theme framework. From many of the popular ones, you don’t have to go far to see a hive of activity of developers, and designers, in forums, and communities helping the bamboozled. The strength of the code, is generally of higher calibre, meeting WordPress coding standards, and can easily be put through its passes, with testing plugins and services, like WP Test, Theme Authenticity Checker (TAC) and Theme Check. To gather this long list, I reached out to several WordPress communities for guidance, and an opportunity to share the not so common, and if you are serious about WordPress and want in, I suggest you join too. Thanks goes out to the LinkedIn Community for their input into many of the frameworks above. It’s almost impossible to cover every framework, new ones appear quite frequently. If you find a framework not listed above, and it is based on the definitions of a framework, a real framework, not a one-size fits-all theme, then by all means, please list it in the comments below. Chris runs Lanauze Designs, a small virtual agency in the Northern Suburbs of Melbourne, Australia. He predominantly works with clients in the Restaurant and Hospitality Industries, of which he has had extensive experience in (an Ex Chef, and Industrial Designer). Chris brings a unique edge to his clients, combining inside Hospitality industry knowledge, Design, Graphics, Photography, SEO, Email Marketing, Marketing, advanced funnel techniques and anything in between. Chris is an active member of the WordPress community in Melbourne and online.